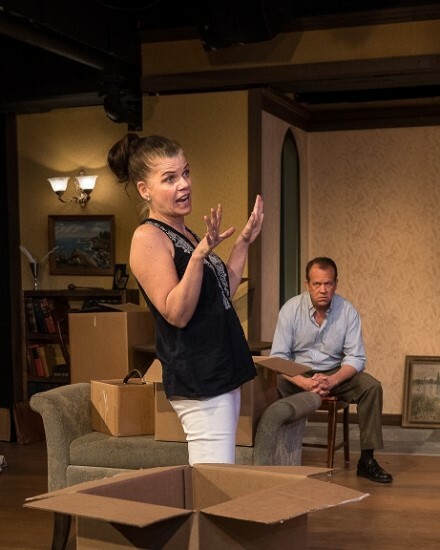 ‘Appropriate’ at Silver Spring Stage. “However, it doesn’t matter how you pronounce ‘Appropriate.’ It is definitely an opportune allocation of your time. Try not to miss it.” – Susan Brall. Synopsis: Every estranged member of the Lafayette clan has descended upon the crumbling Arkansas homestead to settle the accounts of the newly dead patriarch. As his three adult children sort through a lifetime of hoarded mementos and junk, they collide over clutter, debt, and a contentious family history. But after a disturbing discovery surfaces among their father’s possessions, the reunion takes a turn for the explosive, unleashing a series of crackling surprises and confrontations. Maura Claire Harford as Toni and Sam Lunay as Bo Photo by Harvey Levine. 2. 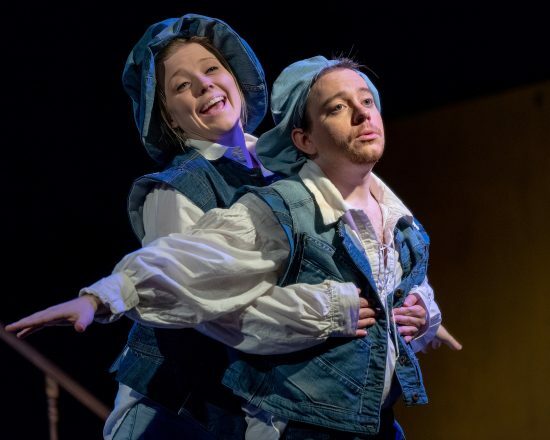 ‘Rosencrantz and Guildenstern Are Dead’ at Fells Point Corner Theatre. 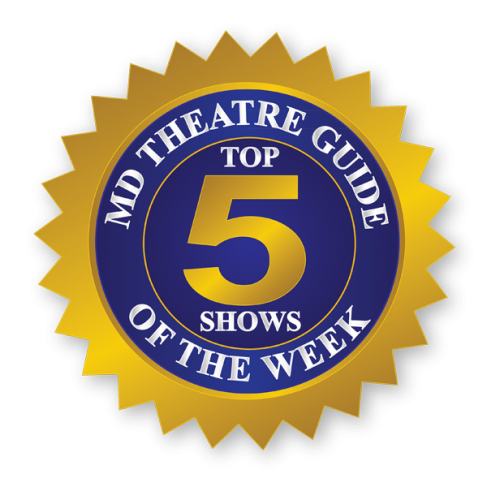 “Fells Point Corner Theatre’s ‘Rosencrantz and Guildenstern Are Dead’ is well worth the price of admission and more.” – John Dignam. Synopsis: From the imagination of one of the most celebrated modern playwrights comes the wildly energetic and nimble play on words, puns and Shakespeare. The absurd, existential comedy by Tom Stoppard features virtually every character who died in Hamlet. Rosencrantz & Guildenstern Are Dead is a dazzling high wire act balancing the monotony of being a bit player in someone else’s story and the profound meaning of simply being alive… or dead. Logan Davidson (left) and Matt Wetzel. Photo by TH Squared Photography. 3. ‘Winnie the Pooh’ at Adventure Theatre MTC. “Seize the opportunity to cultivate an early love of theatre in your littlest ones by taking them on a trip to Hundred Acre Wood.” – Kelsey Casselbury. Synopsis: Winnie the Pooh would spend every day of life humming tunes and stopping frequently to eat “a little something.” But today, Pooh and Piglet have to find the Heffalump, watch Rabbit scheme to rid the forest of Kanga’s dreaded bathtub, and help Eeyore search for his tail. Pooh’s intentions are always the best, but his passion for honey and condensed milk keeps getting him into trouble. 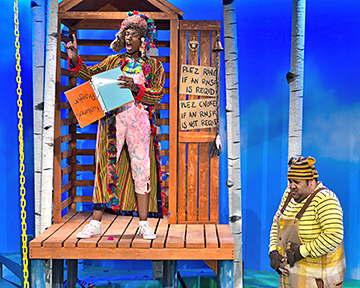 Billie Krishawn as Owl and Derrick Truby Jr. as Winnie the Pooh at Adventure Theatre MTC in Glen Echo, Md. Photo by Bruce Douglas. 4. ‘Clothes for a Summer Hotel’ at Rainbow Theatre Project. 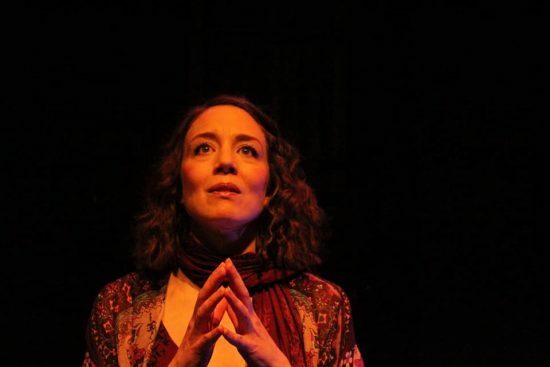 “I strongly recommend “Clothes for a Summer Hotel” based on the extraordinarily divine performance of Sara Barker as Zelda Fitzgerald.” -Liz Ruth-Brinegar. Synopsis: The lives of F. Scott and Zelda Fitzgerald are viewed through the eyes of the master storyteller. A ghost story, by the one and only Tennessee Williams. The phenomenal Sara Barker as Zelda Fitzgerald in “Clothes for a Summer Hotel” by Rainbow Theatre Project. Photo by RCG Photography. 5. ‘Social Darwinism’ at The Department of Visual and Performing Arts, Montgomery College. “. . . a very physical, lively play . . . genuinely funny . . .” – Mary Ann Johnson. Synopsis: ‘SocialDarwinism’ is an absurdist socio-political comedy that follows a familial group: an Alpha Male, Alpha Female, Second Banana, SubordinateFemale, Adolescent Male, Adolescent Female, Outside Male, and Outside Female as they move through several different social classes. The plays looks at racism, male homosexuality, and feminist ideals. Additionally, Social Darwinism shows the subjugation of women, which changes as the play evolves. 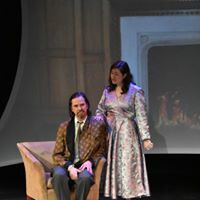 Bill Kassay as the Alpha Male/Jason and Sofia Ohanian as the Alpha Female/Elizabeth in ‘Social Darwinism.’ Photo courtesy of Montgomery College.